Canadian Human Rights Tribunal chairman Athanasios Hadjis over-stepped his authority and erred in law when he declared Section 13, Canada's controversial hate speech law, violates the Charter right to free expression, according to the Canadian Human Rights Commission. Mr. Hadjis's decision to acquit far-right webmaster Marc Lemire last fall after a six-year hate-speech case brought by activist lawyer Richard Warman is the subject of an upcoming appeal in Federal Court, brought by the CHRC. A major factor in Mr. Hadjis's decision was that Mr. Lemire immediately removed the offending material on learning of the complaint, but Mr. Warman rebuffed efforts at conciliation, and the CHRC continued to push the case toward a tribunal hearing. 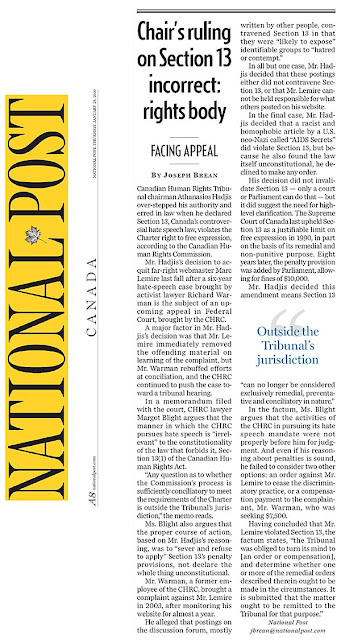 In a memorandum filed with the court, CHRC lawyer Margot Blight argues that the manner in which the CHRC pursues hate speech is "irrelevant" to the constitutionality of the law that forbids it, Section 13(1) of the Canadian Human Rights Act. "Any question as to whether the Commission's process is sufficiently conciliatory to meet the requirements of the Charter is outside the Tribunal's jurisdiction," the memo reads. Ms. Blight also argues that the proper course of action, based on Mr. Hadjis's reasoning, was to "sever and refuse to apply" Section 13's penalty provisions, not declare the whole thing unconstitutional. Mr. Warman, a former employee of the CHRC, brought a complaint against Mr. Lemire in 2003, after monitoring his website for almost a year. He alleged that postings on the discussion forum, mostly written by other people, contravened Section 13 in that they were "likely to expose" identifiable groups to "hatred or contempt." In all but one case, Mr. Hadjis decided that these postings either did not contravene Section 13, or that Mr. Lemire cannot be held responsible for what others posted on his website. His decision did not invalidate Section 13 -- only a court or Parliament can do that --but it did suggest the need for high-level clarification. The Supreme Court of Canada last upheld Section 13 as a justifiable limit on free expression in 1990, in part on the basis of its remedial and non-punitive purpose. Eight years later, the penalty provision was added by Parliament, allowing for fines of $10,000. Mr. Hadjis decided this amendment means Section 13 "can no longer be considered exclusively remedial, preventative and conciliatory in nature." On September 2 2009, the Canadian Human Rights Tribunal acquitted Marc Lemire of all but 1 posting, and found that Section 13 and 54 was unconstitutional! Hardly news but that's their argument : "Nazi Party CHRC lawyer Margot Blight argues that the manner in which the CHRC pursues hate speech is "irrelevant" to the constitutionality of the law that forbids it" ...and irrelevant to the rule of law and due process as well I assume. So the CHRC is arguing that it's perfectly fine for them to abuse due process and natural law as they've done all along - I'm not surprised in the least, the real Nazi's loved laws like Section 13 (1) as well . As a matter of routine the CHRC accepted "evidence" gained through means rightly described as entrapment, withheld evidence and documentation from complainants, ignored their own stated procedures and conducted "investigations" according to instruction from complainants rather than as an independent objective body, further CHRC staff routinely joined Neo Nazi web sites and have been caught registering for and one presumes investigating web sites against which no formal complaints have been filed, have succumbed to undue influence as a result of regulatory capture by politically driven individuals and special interest groups, run roughshod over the right to freedom of religion & freedom of the press all the while subjecting their victims to a punishing one sided abuse of our democratic legal traditions... and the beat goes on - they hope. What a feeble argument. Either the sucker's legit or it isn't. And if it isn't (and it isn't), then the whole thing, penalties and all, must get axed. Will a real judge in a real courtroom fall for this line? I suppose that depends on the judge's ideological leanings. If he or she is someone who is wishy-washy on the subject of free speech and has swallowed the censors' and Official Jews' spin re "hate speech" (i.e. that "evil words lead to evil deeds"), then Queen Bossyboots may well get her power (the power to make you STFU in the name of "civility" and societal "harmony"--don't you pine to live in a bland Utopia like that?) reaffirmed.